Ebon Armory is a dungeon set that drops in the Crypt of Hearts I and II. Armor pieces are Ebon Style in Heavy Armor, and shield and weapon pieces are Soul-Shriven Style. Bonehand's Amulet, a unique drop from Uulkar Bonehand. Dremora Collar, a unique drop from Dogas the Berserker. Heartbreaker's Ebon Greaves, a quest reward for Lover's Torment. Ibelgast's Promise, a unique drop from Ibelgast. Mallet of the Devourer, a unique drop from the Ilambris Amalgam. Standard items in this set bear the name "Ebon [piece]", which is identical to the names of non-set items crafted from Ebony Ore. Don't be fooled by impostors. 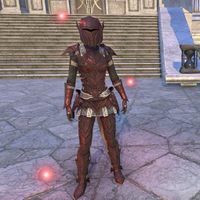 While the armor pieces look like being of Ebon Style, deconstructing doesn't yield Night Pumice. This page was last modified on 10 March 2019, at 18:33.